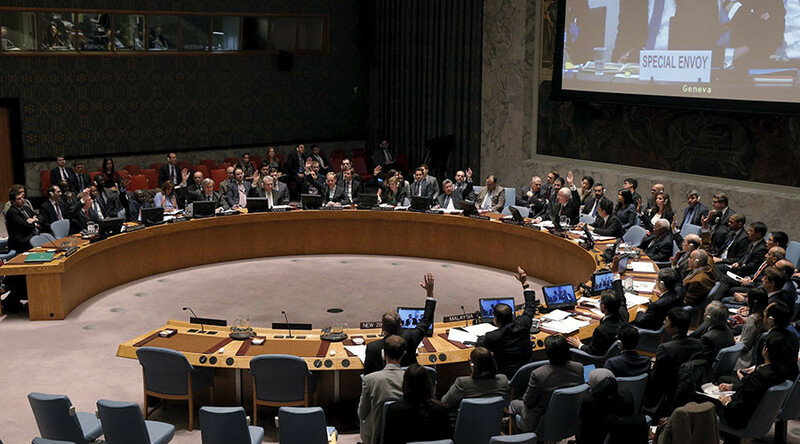 The UN Security Council has adopted a resolution endorsing the cessation of hostilities between parties in the Syrian conflict, except for terrorist groups. New peace talks might reconvene as soon as March 7, if the agreement "largerly holds." Under resolution 2268, a ceasefire across Syria begins at 00:00 Damascus time (22:00 GMT). It demands that all parties taking part in the cessation of hostilities “fulfil their commitments,” which mainly includes ceasing attacks, as well as airstrikes, refraining from acquiring territory, and granting access to humanitarian aid. By agreeing to the US-Russia brokered ceasefire, all parties are also committing to an early release of detainees, particularly women and children, as well as to comply with the resolution’s request to resume the UN-facilitated negotiations. “The terms say that any party to the cessation of hostilities will be able to bring a violation to the attention of the ISSG ceasefire task force—either through the Office of the Special Envoy or directly to Russia or the US as co-chairs,” the resolution reads. However, the ceasefires excludes large areas of Syria, as both Russia and the US are going to continue attacks on both Islamic State and Al-Nusra Front, which are not part of the truce deal agreed to by 97 fighting groups. Yet, the fragile truce that could finally bring an end to five years of violence represents one of the biggest efforts in years on the part of both the international community and Syria to resolve the conflict. “We now have a real chance to end the violence,” said Russian deputy foreign minister Gennady Gatilov. Speaking in front of the UN Security Council, the UN’s Special Envoy on Syria, Staffan de Mistura, said that he hopes the Syria peace talks will reconvene on March 7, if the ceasefire "largely holds." At the same time, Mistura declines to say whether Kurdish representatives would be invited to the next round of peace talks. The highest priority topics for discussion at the talks will continue to be the country’s governance, the formation of a new constitution, and presidential and parliamentary elections to be held within 18 months, Mistura told reporters. He added that the first phase of the talks will last three weeks. The mediator of the Geneva 3 peace talks suspended the negotiations on February 3, citing disagreements between the Syrian government and opposition over humanitarian issues. Earlier in February, Russian Foreign Ministry spokeswoman, Maria Zakharova, told RT that the initial peace talks had been undermined mainly by opposition groups sponsored by the US and Saudi Arabia as they arrived to Geneva with “absolutely non-negotiable” stances.